According to one study, the global packaging industry sold about $485 billion worth of materials in 2004. By 2009, that number grew to $563 billion. It seems that the importance of packaging was always directly proportional to its cost and both were rising to all-time highs over the last decade. Or at least, they were. Thankfully, the digital printing revolution has officially arrived. It’s already changing all of this for the better — forever. Packaging importance is at an all-time high, but costs are driving down thanks to the wonders modern technology has to offer. In many ways, digital printing is the modern evolution of the three more traditional methods of packaging printing: lithography, flexography and gravure. As opposed to these very precise (yet time consuming and ultimately inflexible) analog methods, digital printing allows you to use digital files that, when combined with digital presses, are giving way to incredible boosts in terms of short-run printing in particular. To say that the popularity of digital printing is on the rise is something of an understatement. According to Packaging Digest, the entire digital printing market was worth an already-impressive $7.3 billion in 2013. That number is expected to grow to an astounding $15.3 billion by as soon as 2018. The most immediate benefit that the digital printing revolution has created for small and mid-sized businesses in particular is one of cost reduction. Bringing a product to market is now less expensive than ever, as digital printing flexibility gives you the ability to scale to a degree that wasn’t possible up to this point. Large-scale orders, particularly when it comes to labels, are no longer a requirement because you’re trying to justify the cost. The digital printing of labels is fast, efficient and inexpensive – making things like product test runs for a trade show or other type of event possible for perhaps the first time. Going beyond that, though, digital printing also positively affects nearly every other area of business SURROUNDING that product. In addition to lower set-up costs (not to mention a healthy reduction in capital equipment costs as well), digital printing also provides a very new and very exciting way to add value to the eventual product. Labels can be refreshed astoundingly quickly, giving you the ability to run more promotions, tie-in with special events, offer packaging in multiple languages, target individual groups of customers with more personalized options and more. Many companies are making full use of the digital printing revolution by launching newer products faster in a more affordable way, improving their overall visibility on store shelves as a result. In many ways, this has led to a fundamental shift in the business model itself – “sell it as fast as you can, THEN make it and package it” is quickly becoming the new norm. And NONE of it would be possible without the endless packaging possibilities that only digital printing has ushered in. 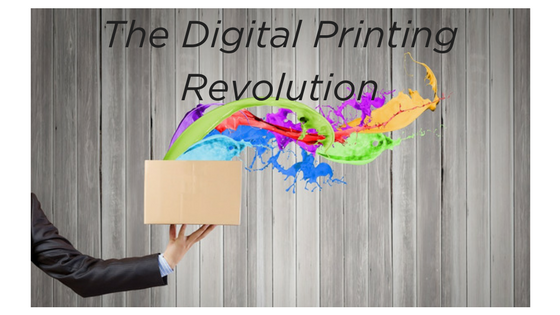 At SLC Custom Packaging, we’ve seen the true power that the digital printing revolution brings to the table first hand. Many of our customers love the fact that we can potentially save them thousands of dollars doing a test run of a product for a trade show or similar type of industry event, rather than committing to a large-scale print run and just “hoping for the best.” This isn’t just something that positively affects their bottom line; it gives them the flexibility, the scalability and the agility to effortless respond to industry demand, make changes and improvements on an ongoing basis and more. All of this ushers in the biggest benefit of all: a superior experience for their own customers. Digital printing isn’t going away anytime soon and at SLC Custom Packaging, we wouldn’t have it any other way. To find out more about it, or to learn more about how we’re more than able to act as your single point-of-contact for all of your quality contract filling and custom packaging needs, don’t delay – contact SLC Custom Packaging today.